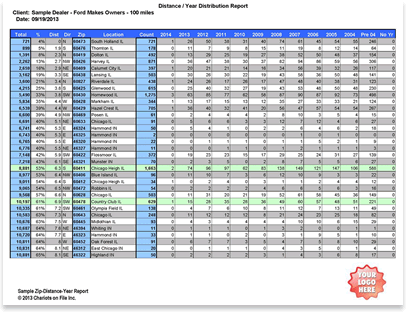 Get customized, full-color reports for your company as MS-Excel files, ready to print in color or black & white. In 1993, we wrote the original report which is now considered an "Industry Standard"
How many sales did your mailing generate? How many new / used? How many Purchased / Leased? Although most of our customers use these reports unchanged, we consider them to be samples. We encourage you to change them or design your own. We will replicate your changes or new designs and keep those reports for your exclusive use. Be creative! This is your opportunity to get those killer reports you have always wanted. © 2013-2015 Chariots on File Inc.